When Idyllwild Arts announced that Harry Shearer, the master of comic voices, would be narrating their first orchestra concert of the year, “Peter and the Wolf,” you knew it wouldn’t be ordinary, but hilariously extraordinary. The student orchestra stuck to Prokofiev’s 1936 music script, but Shearer turned the narrating part on its ear. Without giving too much away for those who plan to attend today’s 2 p.m. concert, Shearer, who does most of the ‘Simpsons’ voices, turned Prokofiv’s masterpiece into a CNN “The Situation Room” news story. Affable talk show host, Larry King, from “Larry King Live” and tightly-wound newscasters Wolf Blitzer and Anderson Cooper told the story in hindsight. He was referring to “The Marriage of Figaro,” aria just sung by Samuel, a barritone at Idyllwild Arts. After introducing the cast of characters and their instruments, Shearer’s Larry King introduced Wolf Blitzer (no relation to the wolf), who said there were no eyewitnesses to the story that just happened in a meadow. “A meadow?” Larry King asked. The Larry King and Wolf Blitzer back and forth banter from “The Situation Room” had the audience giggling and laughing out loud. “Here’s where it gets messy, Larry,” Wolf said, retelling the argument between the bird and the duck. “I always find duck to be messy,” Larry said. Later on in the show, Shearer introduced another CNN newscaster, Anderson Cooper, who tells them how the grandfather finds Peter in the meadow, brings him back home and locks the gate. Shearer’s mimicking of these well-known voices is dead-on. No kidding, you swear that you have your TV on during the concert. When the gray wolf appeared, the duck squawked loudly and got out of the water, Wolf announced. “The lack of any feathers showed that the wolf swallowed the duck whole,” Wolf announced. “I prefer the breast,” Larry replied, one of Shearer’s many references to Larry King’s high-profile divorces. 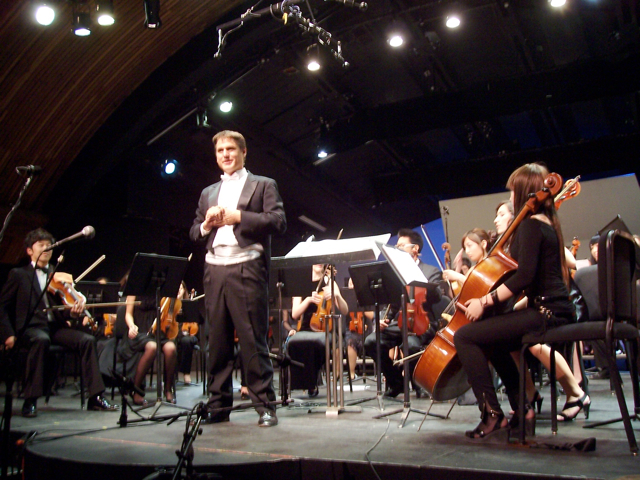 Throughout all of this comedic sketches, the Idyllwild Arts Academy Orchestra, under the direction of Peter Askim, provided professional-level classical music. Even Shearer said so. 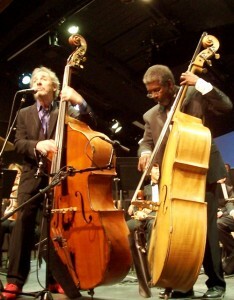 Samuel, a baritone, sang an aria from "The Marriage of Figaro"
After “Peter and the Wolf,” Shearer, who is also a musician, played a bass duet with Marshall Hawkins, head of the Idyllwild Arts Jazz Department. It was a song from his group, Spinal Tap, that was rearranged for a solo with an upright bass. Idyllwild Arts Academy Orchestra’s final concert of “Peter and the Wolf,” with the affable Harry Shearer, will be held at 2 p.m. today (Sunday, Oct. 17) in the Bowman Arts Building on campus. It’s free and open to the public, but you might want to come early to get a seat. For more information, call Idyllwild Arts at (951) 659-2171 or visit www.idyllwildarts.org. Idyllwild resident Charles Schlacks, Jr. shows his rare album of "Peter and the Wolf"
Ever since Russian composer Sergei Prokofieff created “Peter and the Wolf” for children in 1936, it has had tremendous worldwide appeal. Now that the Idyllwild Arts Student Orchestra plans to play it on Oct. 16 &17, people are talking about it again, with smiles on their faces. “Peter and the Wolf” tells the story of a young boy who wanders into the woods in search of a wolf, much to the dismay of his grandfather. Besides Peter and the wolf, the cast of characters includes a bird, a duck, a cat and some hunters. Each is identified by a different instrument. Charles is an avid record collector, to say the least. 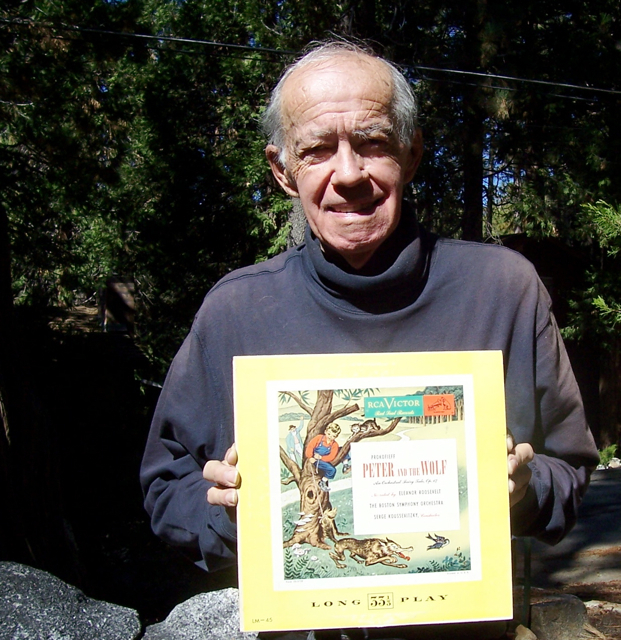 Over the past 30 years, he has amassed 44,500 classical records–of which 26,200 are stored in Hemet, and 18,300 reside in his Idyllwild home. One of his favorites is “Peter and the Wolf,” a 10-inch record, conducted by Serge Koussevitsky and the Boston Symphony Orchestra with the former First Lady Eleanor Roosevelt as narrator. Charles said that he doesn’t know the circumstances surrounding Eleanor Roosevelt as narrator on his record, but, on the back, it states that it was recorded in only three hours in 1947 in Tanglewood, Massachusetts. The record was issued in 1952. They recorded “Peter and the Wolf” on a smaller, 10-inch record because it would only fit on one side of a 12-inch record, Charles explained, and they probably didn’t want to put anything else on the flip side. The entire piece only takes about 20 to 25 minutes. Charles has two 10-inch records of “Peter and the Wolf,” which are worth about $95 each, according to the 2000 edition of the Canfield Guide to Classical Music. He doesn’t remember where he got them or what he paid for them, but he knows that it wasn’t $95. And he’s willing to part with one of them. He said that these “Peter and the Wolf” records are considered “rare” because not many of them were recorded, or are still in existence. 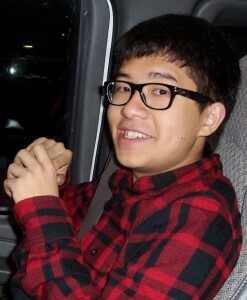 He plans to bring one of his “Peter and the Wolf” records to the concert on Saturday, Oct. 16th, to show people, if they’re interested. 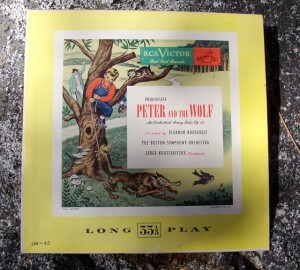 Besides Mrs. Roosevelt, Koussevitzky also recorded “Peter and the Wolf” with Alan Hale, an American actor. “British actor Sean Connery and George Raft, an American actor, have also narrated ‘Peter and the Wolf,'” Charles added. 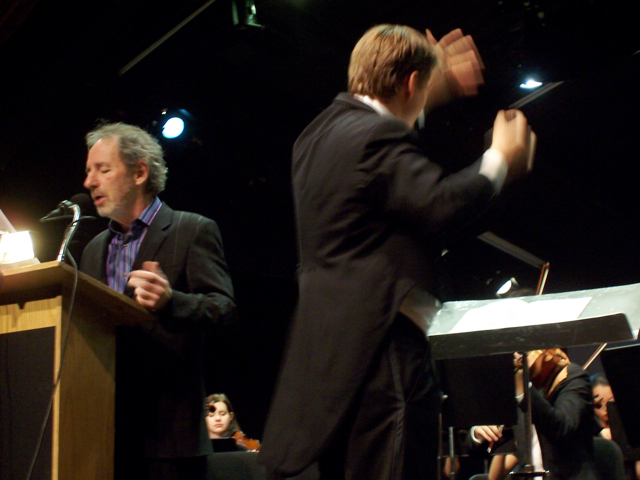 Harry Shearer, from “The Simpson’s” fame, will be the narrator for the Idyllwild Arts Academy Orchestra next weekend. Chen, a junior at the Idyllwild Arts Academy, was chosen to play the role of the cat on his clarinet in “Peter and the Wolf.” He remembers performing it four years ago in China, when he was 12 years old. Shen doesn't like cats, but he plays one in "Peter and the Wolf"
He said that the melody of the cat is pretty much the same throughout the entire piece, but he’s glad for the role. He also doesn’t like cats. He added that he doesn’t have to like cats to play the piece, just has to know how they act. 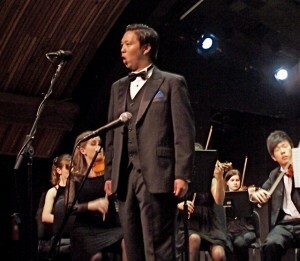 Charles said that he always attends the Idyllwild Arts concerts, even though the acoustics are not the best at the IAF Theater in Bowman. He said every time he hears “Peter and the Wolf,” it sounds differently. Even if you went to both concerts next week, they’d sound differently. The Idyllwild Arts Academy Orchestra will play “Peter and the Wolf” with Harry Shearer on Saturday, Oct. 16 at 4 p.m. and on Sunday, Oct. 17, at 2 p.m. at the IAF Theater in the Bowman Arts building. All concerts are free and open to the public. For more information, contact Idyllwild Arts at (951) 659-2171 or visit www.idyllwildarts.org.